The prison ship Perdition, a floating city where the Conglomerate's most dangerous criminals are confined for life, orbits endlessly around a barren asteroid. Life inside is even more bleak. 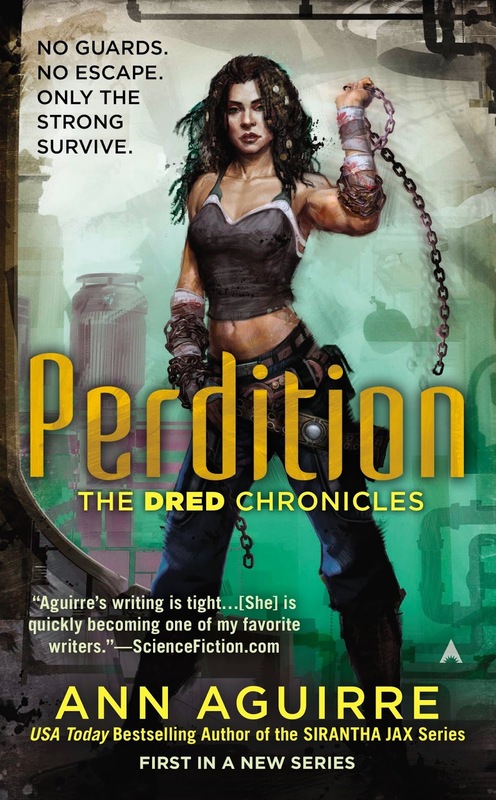 Hailed as the Dread Queen, inmate Dresdemona "Dred" Devos controls one of Perdition's six territories, bordered on both sides by would-be kings eager to challenge her claim. Keeping them at bay requires constant vigilance as well as a steady influx of recruits to replace the fallen. Survival is a continual battle, and death is the only escape. Of the newest convicts, only one is worth Dred's attention. The mercenary Jael, with his deadly gaze and attitude, may be the most dangerous criminal on board. His combat skills could give her the edge she needs, if he doesn't betray her first. Unfortunately, that's what he does best. Winning Jael's allegiance will be a challenge, but failure could be worse than death . . .
Set in the same world as Ann Aguirre's Sirantha Jax series Perdition takes place on a prison space ship that is the dumping ground for the galaxy's most dangerous criminals. Everyone sent to Perdition has been given a death sentence and the ship has been set up with is no chance of escape so the authorities don't even bother to provide guards to keep the prisoners under control. With limited resources and full of the most violent and terrifying prisoners the ship isn't exactly a safe place to be, separated into territories and run by different gangs its a constant battle to protect what is yours and even within the sectors you have to be careful not to end up with a knife in your back. Dred is the leader of one of the six territories inside of Perdition and its a role she takes very seriously. She has to constantly be on her guard and must never show any sign of weakness because there are always people looking to steal her crown and take the reins. With the latest influx of new prisoners Dred ends up recruiting mercenary Jael to her gang, he's an incredible fighter who can heal from practically any wound so he's the perfect person to have on her team but can she trust him not to betray her? I absolutely loved Jael when he was first introduced to the Sirantha Jax series but understandably went off him after certain events in Doubleblind so I was wary of his character going into this. I'm actually glad he's being given the chance to redeem himself though and I really enjoyed getting to see some of the story from his point of view. Getting inside his head helped put previous events in a different light, it doesn't excuse Jael's actions but it makes it easier to understand where he was coming from and why he chose to do what he did. Because we get Jael's point of view we see see a softer more vulnerable side to him which made him easier to connect to, he's still his badass self though and there is plenty of his jokey banter to add a bit of levity to what is essentially quite a dark story. Dred is a brilliant character too, as the one in charge she can never show even a hint of weakness or she'd be eaten alive by the people around her. No matter how respected she is these are hardened criminals and there is a reason they all ended up on Perdition in the first place. Dred is as ruthless as she needs to be and she can certainly hold her own in a fight but when she's alone with Jael she is able to show a side of herself that she has to keep hidden around everyone else. I'm totally shipping them as a couple but what remains to be seen is how they can build a better life for themselves in such a toxic environment. Ann Aguirre writes about life on the ship brilliantly, she shows just how desperate people are thanks to the lack of resources and she's definitely captured the sense of hopelessness that everyone feels knowing they're stuck there. The only one who still has hope is Jael because he is determined to find a way to escape but everyone who has been there longer knows its an impossible dream. This book is dark, life on board is ruthless and nobody is safe so be prepared to have your heart ripped into tiny little pieces, life is dangerous and not everyone is going to survive in such a horrific environment. This was a great introduction to the series and I'm definitely looking forward to seeing what else Dred and Jael can achieve working together, I may end up enjoying this even more than Sirantha's series!